There are lots of my old mates here today. Jumpout Joey has jumped out of the woodwork, and look, there’s Jungle Ruler, and hey, there’s Rockpecker, and look at Zipping! He looks as if he’s spent the last two years in a knee-high paddock of lucerne. Just enter “Zipping” into the search box to see what he looked like two years ago! The Classic should really be called the Williams Classic. And you have to give team Williams some credit, even if you do tire of Nick’s speeches. They have pioneered the use of two strappers with all their horses and have turned it around from being a negative variable ten years ago, when the book was published, to a positive one today. Clearly, the book does need an update, and I am slowly working on it! Mourayan was the favourite but had the glue on shoes. 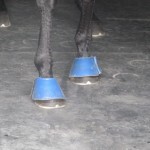 The new sort are virtually impossible to detect by eye, but if you look carefully at the photo (click it a couple of times to blow it up) you will notice a slight colour discontinuity at the distal (big word) end of the hoof. 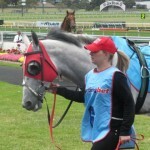 Team Williams also routinely employ a pony with all their horses. No wonder they have a mortgage on this race. Mourayan was busy kicking and pawing on his new shoes in his stall so he was a definite lay, but I was too busy backing Exceptionally for the place to worry about it. 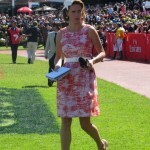 For the last few months or so I have been printing out the list of gear from the Racing Victoria website. Previously I just used to look at the published gear changes, but the complete list is quite useful. However, the more I compare my notes with the official list the more discrepancies I find. Horses have the wrong gear, no gear or additional gear. Occasionally $50 fines are handed out, but there seem to be heaps that get under the stewards’ radar. Maybe there are announcements at the track and I just don’t hear them. Chasm was meant to have bar plates but blowed if I could see them behind the can of Jim Beam. Life as a horse watcher was never meant to be easy! 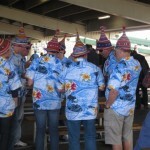 And the boys were there in their Hawaiian shirts and silly hats. 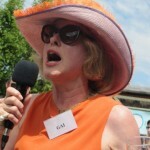 The carnival wrap up, and nice to go out on a high. Two out of two with Fawkner just missing in the Stakes and Crafty Irna surging for third in the mares. A hard and demanding four days, for a pretty good strike rate of nine out of twelve bets for the week. I missed on the Cup. The beautiful chestnut English stayer Red Cadeaux was clearly the most relaxed horse in the yard, and wasn’t suited by the slow pace, but still ground home. He reminds me of one of my favourite horses, Persian Punch! I missed the trifecta as well, getting Green Moon and Jakkalberry, but leaving out Gai’s French import, the “parachute” horse, Fiorente. I couldn’t come at him after he was rearing, neighing and dumping in the yard, although Gai gave him a good spruik at her stable show on the Sunday. 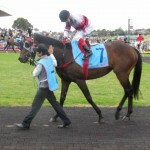 I kept Green Moon in the trifecta, but couldn’t back him straight out after his poor Cox Plate effort. 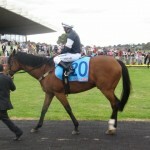 The connections are a bit tricky too, describing the horse as being “battered and bruised” after the race. 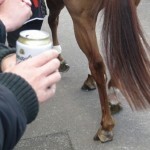 Radio National was chasing me for an interview on Cup Day which never eventuated. They initially wanted to do me after the race in the studio for ten minutes, but wouldn’t come at a helicopter. They offered a Cabcharge, but the taxi line is 100 metres long on Cup Day with no cabs, so I finally suggested the train. It all fell in a heap and it was decided to do a phone interview on Cup Eve. They promised eight minutes, but then Chuck and his Duchess arrived and they downgraded me to four minutes in order to interview an etiquette expert. After holding me on the phone for ten minutes I was finally told that time had run out! Bumped for blooming royalty! Bring on the republic! 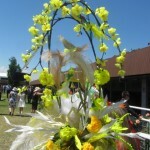 And I’ve cast my vote in the Fashions on the Field. 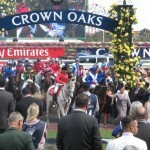 The greatest day’s racing on earth. And a great day it was too, with an outstanding omen. 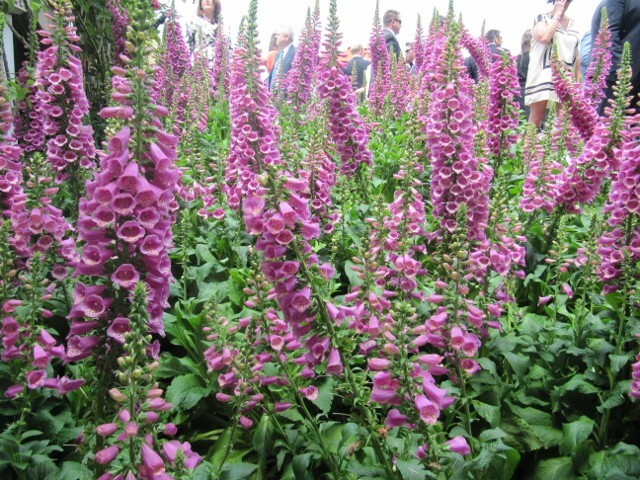 The VRC has planted a special tribute garden in honour of the foxglove, Digitalis purpurea. This is the plant from which the drug Digoxin is derived. Digoxin of course is the miracle drug used to treat atrial fibrillation and atrial flutter. I got a dose by IV in Epworth Emergency last June. 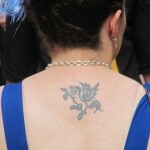 It is probably the only reason that I have survived to enjoy Derby Day. So, here’s to you, foxgloves. How could I possibly lose? Four out of four placed horses, to finally get well ahead for the spring. Proverb, Transonic, Nechita and Tiger Tees. 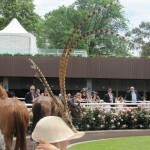 My only complaint is that for the second week in a row I couldn’t get online to lay It’s A Dundeel! I guess with 98,000 people and half of them trying to get on, the 3G does get a bit overloaded!